On the Origin of Technological Civilisation. The parameters usually plugged into the Drake Equation assume that eventually that the development of technological lifeforms is almost inevitable once you get life going, as is even the equivalent of multi-cellular and complex lifeforms before this. Given my perspective as an Earth Scientist by training and hence knowledge about how the Earth, the only place we know life exists, I very much dispute these assumptions. If we look at the Earth as an example of how life may develop on a planet we find from the evidence that simple, single celled life appeared pretty darned quickly after the end of the late bombardment where it would have been practically impossible for anything to survive. So, we can assume that this kind of life is probably likely to spring up almost anywhere in the Universe given similar starting conditions. So, life in the Universe is common. However, after this great “leap” life got lazy. It didn’t really change a great deal for over 2.5 billion years. OK, it had to cope with the rise in oxygen and switch power sources but otherwise it didn’t do a great deal other than maybe become symbiotic and file its DNA away into a special container. Basically, there was no evolutionary massive advantage to change, so it didn’t. From the fossil record it currently looks as though a global climatic event effectively pushed life to co-operate so as to survive in challenging environments. Without this push, life on Earth would probably still be single celled. So, just about a billion years ago we got multi-cellular life… Woo-hoo! It took a while before this became complex though and it seems that only when some of these found eating other life to be a convenient method of energy collection did the arms race begin and complex life began. It was all a big accident! Climbing the ladder to technology? Maybe not. So, from this slow start it only took about 500 million years to get to creatures which could potentially have enough brain power to be intelligent enough to wield tools. So, why didn’t we see technological dinosaurs? Well, technological intelligence requires a couple of things, firstly the abstract, innate intelligence and flexible world modelling capabilities so as to visualise the tool and make the imaginative leap to think them up in the first place. Secondly, you need the twist of evolutionary fate which gives the organism the body parts required to fashion and use technology. It’s becoming more and more apparent that many creatures from many strands of life are capable of the first part. Not only great apes or primates or even mammals but birds (i.e. dinosaurs) and even molluscs (Cephalopoda, i.e. octopus). However, most of these intelligent beings are handicapped so that technological advancement isn’t practical. They either don’t have the tools, don’t have the time, live in the wrong sort of environment or aren’t social. Also, in many ways, the pre-requisites for being technological aren’t usually the best for long-term survival in an evolutionary sense. Generalists generally find it hard to compete against specialists, unless there are specific environmental drivers which cause the specialists to fail. Humans almost didn’t make it. So, humans are an accident? Basically, yes. We are an aberration. We only made it as a sheer fluke. Given the odds we shouldn’t be here at all and the planet Earth would be no different than it has been since the last great extinction. So, what does this mean for the Drake Equation? We have to remember that we’re looking down the wrong end of the telescope at this problem and hence get a very skewed idea. We are here to observe and hence is seems that that must be proof of the inevitability of us appearing. The original parameters of the Drake Equation reflect this and are, in my opinion given the evidence, several tens of orders of magnitude too optimistic. Well, even given the hugely, mind bogglingly big numbers of potential life harbouring planets out there it’s very probable that only a really, really tiny percentage managed to get beyond single cellular organisms. Even then the combination of factors which would allow a society to develop technology and become a civilisation are so remote and actively discouraged. Is there anyone else out there then? Given the odds it’s quite possible that we are the very first technological beings to exist within the Universe, given that the Sol system was possibly one of the first to appear after enough building blocks had been created by the previous generations of stars. Even if we are not, given the number of star systems out there, the time scales involved and the probable life of any species being only a couple of millions of years at best we’ve probably missed the previous ones and others will appear after we’re long gone. We are but a fleeting island in entropy’s march. Nabbing PANSTARRS: Surprisingly got it. Planets a-hoy! The benefits of getting up early. It was an early start, 4:30am to be precise, but that’s the only time when you can catch anything really photogenic in the sky from my back garden at the moment as I’ve yet to get beyond the light pollution for the deep sky objects. It was a beautiful morning. The sky had lost all of the high, con-trail derived cloud from the night before, which had obscured practically everything and the air was still. It was chilly enough to need a hat and fleece but otherwise comfortable. The stars shone but were nothing beside Venus, the Moon and Jupiter. Seeing as Jupiter had for so long been out of view I immediately slewed the telescope around to point to it, looked in the eye-piece, focused and discovered that the shadow of one of the moons was passing across the face and was close to the edge. 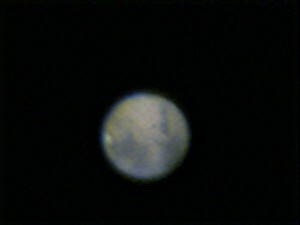 I needed to be quick to be able to catch it in an image so rushed the “Imaging Source” camera out of its box, fitted the Baader filter and the Powermate 2.5x magnifier and started up the software. 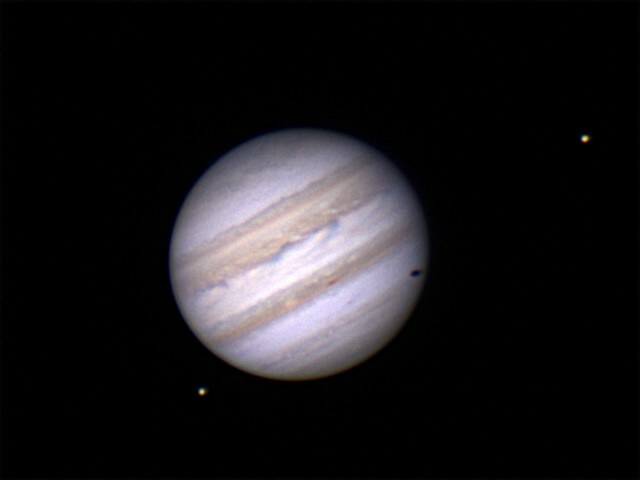 5:09am: Jupiter with Europa (lower left) and Io (upper right). Europa’s shadow is just leaving the edge of the face of Jupiter. 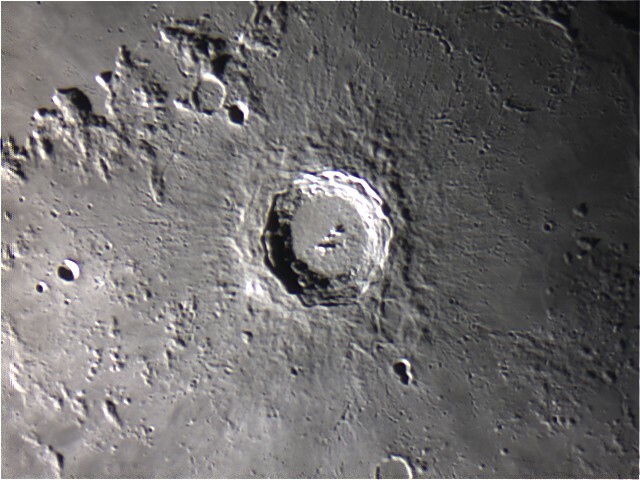 6:03am: The lunar crater Copernicus. 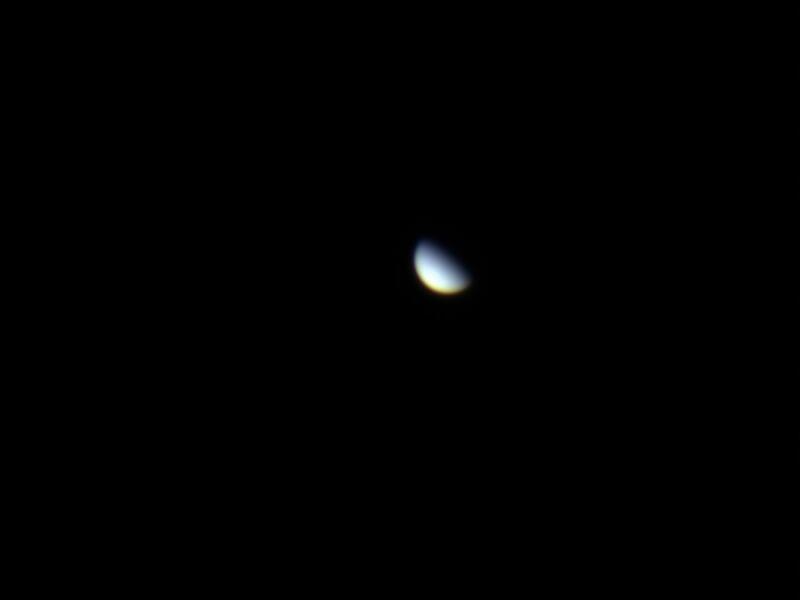 With light levels increasing and sunrise son to be upon me there was only last target, Venus. And so, that was that. I stowed away the telescope, shut off everything, closed the roof and came indoors, and off back to bed for a couple of hours. Geological Interpretation of a Curiosity Rover Image. 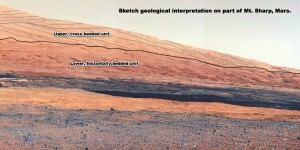 Geological sketch of Mount Sharp, Mars. Horizontally bedded rocks on Earth are generally laid down in water, so the lower unit was most likely to have been deposited in a wet environment. Large scale cross bedded rocks are usually sub-arial wind-blown deposits, as in sand dunes. The bedding being the shadow of the trailing slope of the dunes as they march across the landscape. What you see left behind is the root of the dune. The scale in the image is hard to gauge but seeing as the scarp is a couple of miles from the rover, the size of the dunes which generated the cross bedded units must have been many hundreds of metres high. It should also be noted that the top of the lower, horizontally bedded unit seems to be an uneven erosional surface, suggesting a large time gap between the lower unit’s deposition and that of the upper unit. My last update on my astronomical exploits was way back at the beginning of February. 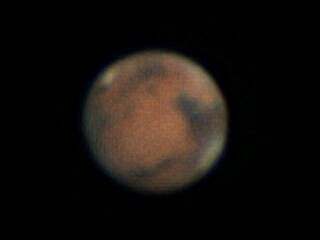 At that point I’d just got the new telescope installed and Mars was getting closer to opposition. 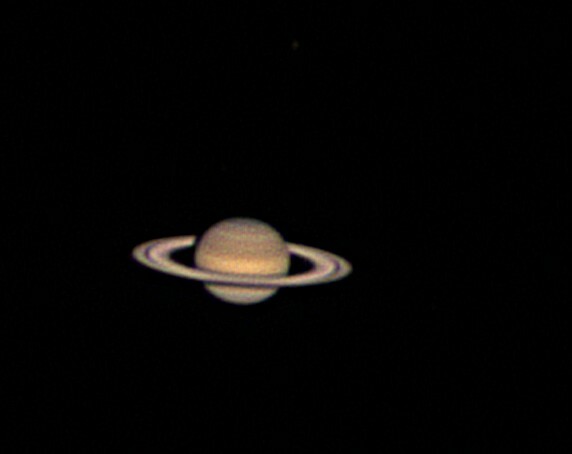 Between then and the end of May was quite a busy time in the sky when it came to planetary observation as Mars continued to be visible from my back garden for much of the time and Saturn came out to play as well. Unfortunately, after the third week in May both planets were obscured by the house by the time dusk fell. 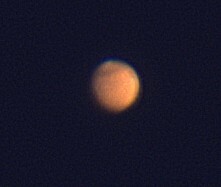 Even so, I managed to get some decent images. 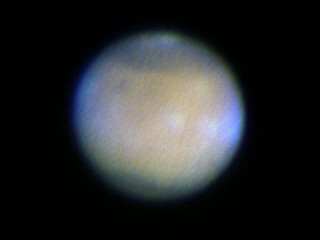 I’d already managed to get one good image of the planet by the beginning of February but due to cloud cover the the next opportunity wasn’t until early March. Thankfully, there was a short period of very good seeing, allowing me to even image clouds developing within the atmosphere. Details on the surface weren’t that clear, but that was partly due to the low quality of the camera and its low speed with the light levels available. Once the atmosphere became more turbulent the results were no-where as good. Unfortunately, by the end of March the weather closed in and the next time I could get out to view the sky was in May. Before long, however, it became impossible to image. It’s been two years since, and still people are asking. It’s somewhat surprising but it’s practically two years since I last wore the kilt properly and yet I’m still getting asked if I’m going to wear it again now any again. The most recent event where I was asked about it (all were women) was at the University of Oxford ICTF Conference. This is an annual event currently held at the Kassam Stadium where the majority of the University’s IT staff go and “network”. The continued interest in the kilt wearing made me think that I needed to once and for all do a poll and find out what people really thought about this subject. To this end I used an “app” on Facebook to create one and invited all those on Facebook and a few other friends to take it. One thing which made me wonder is that the number of people who believed that it was inappropriate to wear a kilt in a modern social context was larger than the number who thought it would be a bad idea to wear it. Anyway, I can now point to this poll as the reason I don’t go around wearing a kilt all the time.